The Legacy Golf Resort is on 280 acres of space and is a top rated golf destination situated at the base of Phoenix’s South Mountain. This resort offers 328 suites, which have a spanish style theme throughout. This resort separates itself from other accommodations by providing full kitchens or kitchenettes, spacious living areas, Jacuzzi tubs in some rooms, and stunning views. The Legacy Golf Resort also offers numerous amenities, such as free WiFi, to make the stay as enjoyable as possible. This resort has a list of amenities that compel guests to ask the question, why leave the resort? The resort features a swimming pool with a poolside bar, full service restaurant for all meals of the day, golf, spa, even an atm, and more. The resort has complimentary wireless internet access to stay connected, and a 24-hour front desk to answer all the questions that may arise. Golfing is not limited to those who play either, as onsite there is a full service golf shop and personal instruction by PGA pros. Among the many other sports offered, there is a fitness center and a BBQ picnic area. People driving or renting a car to travel around the area will find complimentary parking to be a welcomed addition. The Resort is situated in the heart of attractions, museums, family fun parks, shopping, sports and theater. 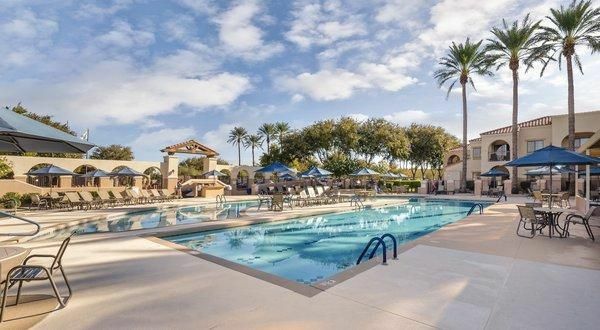 Famous for Spring Training, the resort is also close to the Cactus League. The Phoenix Zoo is also very close as well as the Desert Botanical Garden. For those looking to explore, the Apache Trail and Superstition Mountains are an excellent place to check out. The extensive list below, highlights a lot, but still is just a portion of all the surrounding area has to offer. On the left hand side of the list below is the attraction or place, and on the right hand side is the distance from the resort the place is. The studio condos, at 419 square feet, have room for up to 4 people. Amenities are broken down below by room or area of the unit, but there are some which are important to touch upon. The washer and dryer help guests avoid overpacking, or if traveling via airplane, help avoid unnecessary baggage fees. Phoenix’s excellent weather provides guests to enjoy their, fully furnished, private balcony or patio. The fully equipped kitchen allows for guests to cook delicious meals from the comfort of their condo, or bring back leftovers from a night out.